made these for a daughter of a friend, my daughters are clamoring for their own sets, and I jsut have to wait till christmas is over so I can make them some of their very own. I whipped this set up second. 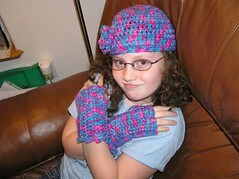 My daughter who is modeling them really wants her own set and not give them away for christmas!! 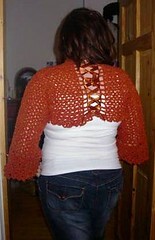 They really do crochet up really quickly, and are fun!! No pictures, I am too tired. I made the girls each a pair of pj bottoms, they are so happywith them. 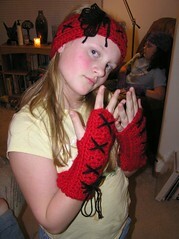 I am making some beanies with matching wristlets for some christmas presents. I have to make the SIL a pair of pj bottoms too. Otherwise thinking of throwing in some purses and such over the next few days and see what I can come up with. I did get my RN license though! I m so relieved about that... its all over, now just to start working. I love those ribbons, such a great color combo. ribbons at the bustline are the armpit adjustable ones for the body opening. YAY, my partner received. 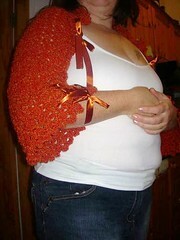 This is my first swap I have participated in and she is RAVING about her shrug, which is awesome because I had some major nervous thoughts on: will she like the color, will it fit her, etc. I am so happy she likes it, I guess her young daughter wanted it too. She suggested I make a tutorial for it, and pattern. I will have to sit down and remember how I did it. 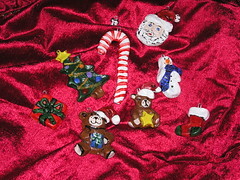 Just some dough ornaments the kids and I made...these are the ones I created and painted. The girls still have to paint and gloss theirs. They went to Homer for the weekend, 6 hours south of where we live... Right now I have christmas crap strewn all over my living room...UGH... its a bit different to haul it all out from under the stairs and try putting things up without the kids around... I did get their advent calendars all wrapped up though... we don't do calendars necessarily we just wrap a present a day with a couple bigger ones for christmas day. I got my cousin's advent calendar done, late, and I ll have to mail it on Monday. I told her when it arrives in Denmark she'll have LOTS of presents to open for the days it missed her in transit! !